namaḥ (n/V) – adoration, homage; tuttāre – [a holy sound]; hūṃ – [a holy sound]; kāra (m) – [term used to signify a letter, sound or indeclinable word]; pūritā – filled, completed; āśā (f) – space, region, quarters; ādi – beginning, [ifc:] etc. ; gantare (m/sg/D)– walker; sapta – seven; loka (m) – world; krama (m) – step, going, level; ākrānti – stepping on, overpowering; niḥśeṣa – without remainder; whole, entire; ākarṣaṇa – pulling, drawing near, attracting; kṣame – patient, able, suitable. The fifth is the praise to Rigyed Lhamo,Tib the “All-Knowing Lady” who has the quality of magnetizing1. This red Tārā sits on blue lotus and holds a bow and an arrow. She fills the desire realm, its aspect, which is the form realm, and space, which is the formless realm, with the brightly radiating TUTTĀRE mantra2, and the sound of HŪṂ. (Phyogs in Tibetan is an ambiguous word. In this instance, the author of the commentary interprets it as “the aspect” of the desire realm.) This is because beings in both the desire realm and the form realm share the same aspect of having form. Likewise, “space” is interpreted as the formless realm. The radiance of the TUTTĀRE mantra and the sound of HŪṂ symbolize her realization of emptiness3 and compassion. She conquers the seven worlds by just trampling them with her feet. If she is able to summon all of these forces without exception just by the power of the mantra, there can be no doubt of her power over the lesser forces, for example: saṅgha, kings, ministers, and landlords. There are a number of different identifications of the seven worlds. Jetsun Drakpa Gyaltsen points out they are the five goers, and the two upper realms, which makes seven. Drolgon Zhab says the seven worlds are the realms of the nāgas, pretas, asuras, humans, vidyādhāras4, kīnāras and gods; the seven realms with power. In the commentary by Gedun Gyatso, the seven realms are comprised of the six realms: (the realms of the gods, jealous gods, humans, animals, hungry ghosts and hell-beings), and the realm of the bardo, (which is also known as the intermediate state). Others write that the seven worlds are: the sky, the form and formless realms, and the worlds of ten directions. Rigyed Lhamo magnetizes and leads beings to the path of the three yānas. The ultimate meaning is that through practice, when non-conceptual neutral ālaya’s clarity is cognized, the formless realms dissolve. When the simple pure luminosity of the undiscriminating clarity of ālaya-vijñāna5, or “base of consciousness” is cognized, the form realms dissolve. When mental consciousness is free from delusion and the five sensory cognitions, the desire realm ceases. These cessations are the abiding purity, or the fruition of purification. At this stage of awareness, the seven worlds are the seven cognitions, where all the concepts of desire and the other three realms without exception dissolve into dharmadhātu6. 1 magnetizing ~ One of the four powers used by a practitioner to remove obscurations and obstacles to practice. 2 mantra skt ~ A ritual formula used in Tantric practice, literally means “protection of the mind”. 3 emptiness (stoṅ pa ñid, Tong pa nyid, śūnyatā skt) ~ The absence of true existence of all phenomena. 4 Vidyādhāra skt ~ An “awareness holder”, one who has realized through profound skillful means awareness of the Buddha-body, speech and mind. 5 ālaya-vijñāna skt ~ The foundational consciousness, one of the eight types of consciousnesses. 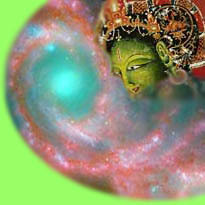 6 dharmadhātu skt ~ The sphere of reality, the ultimate truth.